The Lucina sounds good and is compact, but for a rather niche product, it's expensive. Compact and easy to use. A good range of usable sounds onboard. USB audio file playback. A touch expensive for what it is. Mod bar gets in the way of the ribbon controller. Black version costs more. Roland has been busy lately, and its latest is a slimmed-down version of the AX-Synth keytar (or shoulder synth, as Roland would have it). The Lucina AX-09 can be run on mains or battery power and has plenty onboard in terms of sounds and features. One thing's for sure, this is a unique looking keyboard. It's space age and toy-like but professional at the same time, with a good measure of home keyboard feel thrown in too. Not since the Jupiter-4 have we seen controls below the keyboard, either! Build-quality is similar to its more expensive brother (though still pretty plasticky) and the off-white case looks a little uninspiring. However, for a little more outlay, there is a black version available that looks more serious. Yes, you have to pay £50 for that 'black sparkle' privilege. The Lucina is nicely balanced once strapped on, though accessing some performance controls involves a big readjustment of hand position. For example, if you have your hand clasped around the modulation bar/handle and want to use the D-beam, or any of its selectors (for filter/pitch/assignable duties), you'll need to let go and move your hand into a completely different position. Another issue with the Lucina (and that we also had with the AX-synth) is the height of the mod bar. It really gets in the way of the ribbon controller below it (used for pitch-bending) which is a pain for those with smaller hands. It's workable, but still not ideal. To the right of the mod bar are octave/transpose switches, while underneath the keyboard lie all the patch selection buttons (six banks, 144 sounds and six special tones), covering pretty much every staple sound you might want for most styles of music. There's also a small red numeric display to denote which patch is selected within each bank and a facility to store favourite patches for quick recall. The controls generally work well in this position and don't get in the way of the keyboard when playing, plus there's a Lock button to prevent accidental patch switching. More importantly, the 37-note keyboard itself has a nice feel, is fast to play standing and not too stiffly sprung. Sound-wise, the quality is generally good, though some of the patches are swamped in delay and reverb. Effect level (plus attack/release/cutoff and resonance parameters) can be adjusted using the Shift+Tone buttons. Standout sounds include the woodwind, brass samples, synth pads and strings, plus there are some good organs, pianos and electric pianos too and a good range of bread and butter leads, basses and guitar sounds, all with a very digital sound. 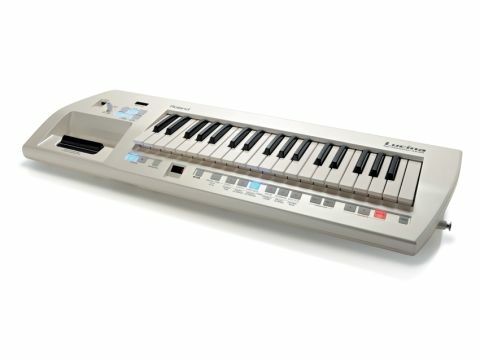 The Lucina is a suitable first and fun purchase for any aspiring keyboardist, though it's also professional enough to use on stage in a more serious capacity, either using its onboard sounds or MIDI'd to a sound source of choice. Also, the MP3/ WAV/AIFF USB playback functionality and MP3 player input are very slick. All in all, the Lucina is a decent little keyboard that covers a lot of bases in a portable and easy-to-use package. We can imagine newcomers and pros being equally enchanted, but £549 for a fun keytar is pushing things a bit for both potential markets. It works well, looks good and sounds good, but it's no bargain.